In the Middle Ages, horses were used for everything from transportation and clothes to food and warfare. During that time period, people knew how to behave around horses because horses were a part of their everyday lives. Nowadays, we barely see a horse unless it is in the movies. So it is no surprise that most people are somewhat fearful of horses. Afterall, a thousand pound horse packs a powerful punch. He can swing his head like a sledge hammer, strike with his forelegs, or kick to the side or back wards with a hindleg. No doubt you are wondering: Why would a horse try to hurt a person? Is there any safe place around one? Can I have a fun day riding this scary beast? I hope to give the novice SCA rider some pointers on how to behave around a horse so that neither of you will get hurt and you can experience this fundamental part of the Middle Ages. A properly trained horse is normally a docile and non-aggressive animal. Such a horse is taught from a very young age that humans are in charge. They believe that humans are 'bigger' than they are. This is true even when the horse attains his full size and weight. However, all good training does not completely withstand a fearful situation. Thus, even well-trained animals will either fight or take flight when frightened. Even normal non-abused horses may become frightened or 'spooked' for no apparent reason. Their reaction is to run away as far and as fast as they can go. Sometimes, however, they will kick at the object of their fright. A horse will spook at something as inocuous as a leaf blowing across his path or a cloak flapping in the wind. Personally, I think that a horse spooks even at invisible things (like ghosts? Hence the term spooked?). The other extreme is the non-socialized or abused horse. A mistreated horse is frightened of pain and will usually respond by attacking rather than running away. Some rental horses have been abused by unknowing riders, so you must be particularly alert and gentle around rental horses. Other rental horses may have developed bad habits like nipping their rider or kicking other horses. However, most rental horses are usually docile, good around other horses, and tolerant of ignorant riders. The bottomline is that all horses can become frightened and will spook at loud and unusual noises, like clanking armor or hitting the quintain shield. They do not like surprises like a flapping banner or long sticks like spears and lances waving around their head. It is imperative that you keep your gestures slow and deliberate, so the horse can see that you are no threat to him. You should be quiet and gentle. If you are wearing a flapping costume or carrying a strange item, you must let the horse see and smell you and the item, so he can ascertain that you will not harm him. The safest way to approach a horse from any direction is to let him know that you are coming by talking or whistling quietly as you slowly walk up to him. Watch his eyes, ears, and stance. You can tell he sees you, because he will turn his head to look at you with his eyes, his ears will tip towards you, and his stance will remain relaxed yet alert. However, if a horse is surprised or threatened by your approach, he'll get a wild-eyed look, his ears will flatten against his neck, and his back and hindleg muscles will tense in preparation for running away (bolting) or kicking. The safest place to stand near a horse is right up against his shoulder. In this position he cannot kick you. However, be alert because he may be able to hit you with his head, nip you , or step on your feet. In the grand scheme any of these things are better than being kicked. When you stand right up against the horse's leg and he tries to kick you, the rising leg will actually push you away. This works only if you are standing right against the origin of the blow. Try this with a friend. Stand against a friend's arm and have him raise it as if to hit you. What happens? He actually pushes you away with the arm as he raises it to strike. Now try the same thing, but stand several inches away from his arm. Now your friend can raise his arm easily and has enough room to strike you with full force. In the case of a horse's leg, his striking range is anywhere from several inches to several feet. So you are safest either by standing completely up against the horse or at least 8 feet away from him. There is no safe area in between. Keep this in mind when you are working on a horse to groom and tack him up. The best way to walk around the hindquarters of a horse, is to start at his shoulder, keep one hand on his back gently rubbing it , and walk right up against him as you quietly talk. (NB: this will also work on your friend). Always watch his eyes and ears to make certain that he knows and accepts that you are there and are not a threat to him. Anytime you hurt or scare a horse, chances are pretty good that he will hurt you. Jerking the reins hard, will cause the bit and curb chain to put painful pressure on his mouth and chin area. A bit works by sending subtle signals to the horse. It is not used to jerk the horse's head towards the destination. In fact, if you jerk hard on the reins, the horse will likely toss it's head up to relieve painful pressure and his head can hit you in the face. Use the reins to direct the horse to turn by making small movements with your hands. Also, keep your hands low near his withers and in front of the saddle horn, so the bit will exert the proper pressure. You should not kick a horse in the sides or flanks because you can hurt him and cause him to bolt or buck. Instead you should use leg pressure against the side of the horse to signal him as to desired direction. So when turning to the left, use your right leg to put pressure against the horse's right side. The horse will move away from your leg pressure and go towards the left for you. Conversely use your right leg pressure to move the horse away from your right leg in order to turn towards the left. Never wear spurs unless you are an experienced rider and have permission to use them on the rental horse. Rodeo cowboys use spurs to cause pain and thus make their broncs buck harder so as to score more points for their ride. The humane use of spurs is as a gentle aid along with legs cues to direct the horse. Weight cues are also important for you to know about so that you do not inadvertently give the horse the cue to runaway. Do not hit the horse with anything including SCA weapons, whip, riding crop, or the reins in order to make him go fast. You will only spook him and again he may become aggressive or bolt out of your control. The proper cue to go fast is to lean slightly forward in the saddle (think of the jockey riding a race) and squeeze with your legs. Conversely the cue to stop and go slow is to sit upright and relaxed in the saddle. If the horse feels you tense your legs and lean forward, he will think you are telling him to go fast. So if you feel like your horse is trying to run away with you, do not panic. A panicked person leans forward and squeezes his legs. The important thing to remember in order to maintain control is to remain calm in the saddle. You can learn more about cues by reading a book on equitation and then apply the theory by taking riding lessons. A quick word in regards to garb. Try to allow yourself some mobility ---do not wear long material or rigid armor which will hamper your movements. Wear hard-soled boots with a minimum ¼" heel . A riding helmet is a good idea to help protect your head. Many ASTM sport helmets like those for bicycling, will be at least as good as an equestrian helmet. So bring your sport helmet with you. I will write a more in depth article about quick yet period-looking garb. In conclusion, although it seems like a lot of 'don'ts' I can really sum of this article by telling you to simply remember to be a gentle and considerate master and both you and your horse will have a fun yet safe day riding . So sit back and relax and enjoy a true commonplace experience of the Middle Ages, that of riding your horse. Donwenna LaMareschale (know as Beast Healer) is a 12th C Welsh-Norman warhorse trainer and competes in Jousting tournaments. She is the Captain of the mounted military tournament troupe, the Company of St. Anne. Donna DeBonis, DVM owns a Veterinary Clinic in Oak Harbor, WA. She has been known to seek the latest information about anything related to Equestrian Activities within the SCA and to write how-to articles about them. 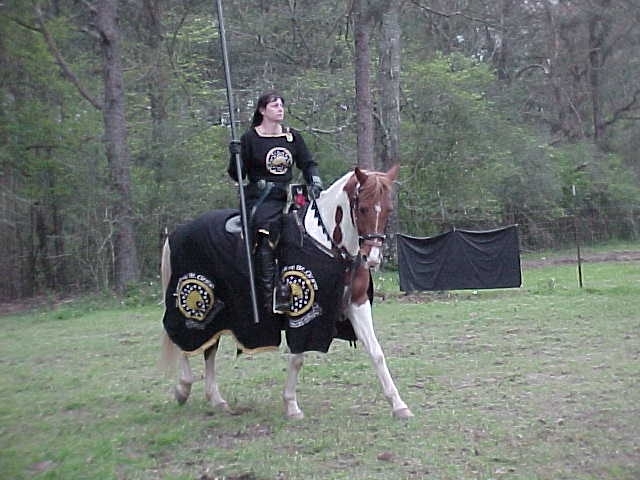 FIGURE 1 Donwenna in her black armor & riding Sancho, a rental horse, before the Great Charge at Gulf Wars X in Meridies.